Change is one of the only constants in incident response. In time most things will change; technology, tools, processes, and techniques all eventually change. The change is not only limited to the things we rely on to be the last line of defense for our organizations and/or customers. The threats we are protecting them against change too. One recent example is the Angler exploit kit incorporating fileless malware. Malware that never hits the hard drive is not new but this change is pretty significant. An exploit kit is using the technique so the impact is more far reaching than the previous instances where fileless malware has been used (to my knowledge.) In this post I'm walking through the process one can use to triage a system potentially impacted by fileless malware. The post is focused on Poweliks but the process applies to any fileless malware. In my RSS feeds, I was following the various articles about how an exploit kit incorporated the use of fileless malware. The malware never gets dropped to the disk and gets loaded directly into memory. A few of the articles I'm referring to are: Poweliks: The file-less little malware that could, Angler EK : now capable of "fileless" infection (memory malware), Fileless Infections from Exploit Kit: An Overview, POWELIKS: Malware Hides In Windows Registry, and POWELIKS Levels Up With New Autostart Mechanism. Reading the articles made one thing clear: one of the most effective tools to deliver malware (exploit kits) is now using malware that stays in memory. This change has a significant impact on multiple areas. If the malware stays in memory then the typically artifacts we see on the host will not be there. For example, when the malware is loaded into memory then it won't create program execution artifacts on the system. This means the triage and examination process needs to adjust. As I mentioned previously, this change was implemented into a widely known exploit kit (Angler exploit kit.) The systems infected with this exploit kit can be far reaching. This means we will encounter this change sooner rather than later; if you haven't faced it already. Case in point, recently the Internet Systems Consortium website was compromised and was redirecting visitors to the Angler exploit kit. The last impact is if this change provides better results for the people behind it then I can see other exploit kit authors following suit. This means fileless malware may become even more widespread and it's something that is here to stay. I knew memory forensics is one technique we can use to find the malware in memory. (if you need a great reference on how to do this check out the book the Art of Memory Forensics.) However, the question remained what does this look like. I took the short route for a quick answer to my question by reaching out to my Twitter followers. I asked them the following: "Anyone know how Poweliks code looks from memory forensics perspective?" 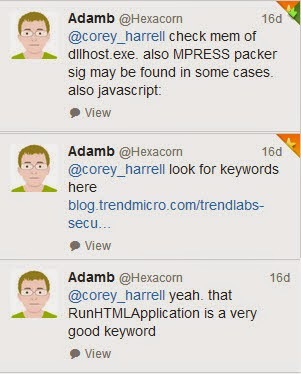 The first responses I got back was from Adam over at the Hexacron blog (great blog by the way) as shown below. @lstaPee provided a few more tidbits. RunDll32.exe injects code into the Dllhost.exe and dllhost.exe should have network connections. The response I got back from Twitter was great but I really needed to address the bigger question. If and when I have to triage a system infected with Poweliks what is the fastest way to perform the triage to locate the malware and determine the root cause of the infection. A question I needed to dig in to in order to find out the answer. As much as I wanted to simulate this attack by finding a live link to an Angler exploit kit I knew it would be very difficult. Based on various articles I read, Angler is VMware aware and it doesn't always deliverer the fileless malware. I opted to use a Powelik's dropper/downloader. I used the sample MD5 0181850239cd26b8fb8b72afb0e95eac I found on Malwr. The test system was a Windows 7 32bit virtual machine in VMware. The test conditions were really basic. I executed the sample by clicking it and then waited for about a minute. The VM was suspended and I collected the memory and prefetch files. I then unsuspended the VM followed by rebooting the system. After reboot, I logged onto the VM and then suspended it to collect the memory and prefetch files. My tests was to analyze the Poweliks infection from two angles. The initial infection prior to a system reboot and a persistent infection after the system reboots. My analysis had one exception. By clicking the Poweliks executable to infect the system this action created program execution artifacts. I ignored these artifacts since they wouldn't be present if the malware was loaded directly into memory. I followed my typical examination process on the memory images and vmdk files but this post only highlights the activity that directly points to Poweliks. There was other activity of interest but the activity by itself does not indicate anything malicious. This activity I opted to omit from the post. Before diving into the triage process and what to look for it's important I discuss one Poweliks' behavior. I won't go into any details how I first picked up on this but I will show the end result. What the behavior is and how it can help when triaging Poweliks specifically. The screenshot below shows partial of the Malwr's behavior analysis section showing the behavior I'm referring to. Upon a system's initial infection, the malware calls rundll32.exe which then calls powershell.exe who injects code into the dllhost.exe process. In the image above the numbers are for the process IDs and this relevant as we dig deeper into the behavior. The images below shows activity that occurs just prior to powershell.exe process exiting. Powershell.exe creates the dllhost.exe process in the suspended state. Code gets injected into this suspended dllhost.exe process and then it is resumed. This technique is process hollowing and when the suspended process is resumed it executes the injected code. Triage is the assessment of a security event to determine if there is a security incident, its priority, and the need for escalation. As it relates to potential malware incidents, the purpose of triaging may vary. In this instance, triage is being used to determine if an event is a security incident or false positive by identifying malware on the system. Confirming the presence of malware allows for a deeper examination to be completed. The triage process I'm outlining is to confirm the presence of the Poweliks fileless malware. Normally, triaging a system using artifacts on the host is an effective technique to identify malware. This is especially true when leveraging program execution artifacts. However, loading malware directly into memory has a significant impact on the artifacts available on the host. There are very little artifacts available and if the malware doesn't remain persistent then there will be even less. Triaging a system infected with Poweliks is no different. Most of the typically artifacts are missing but it can still be identified using prefetch files and autorun locations. 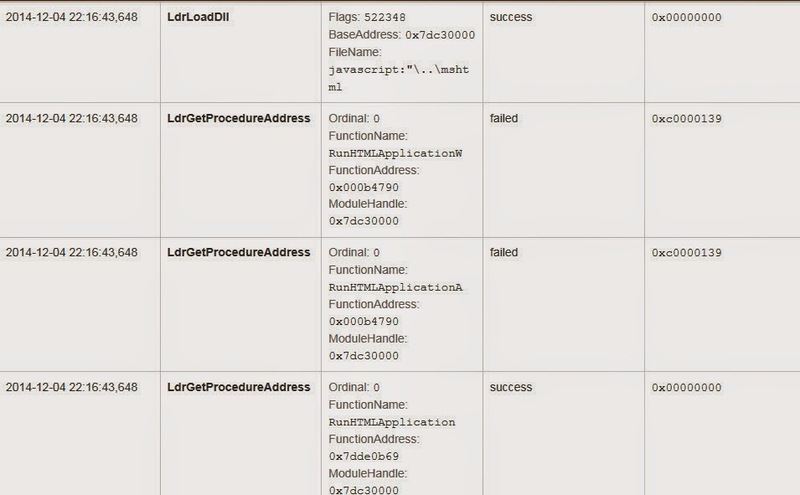 Previously I outlined the Poweliks behavior where the rundll32.exe process runs, which then starts a powershell.exe process before injecting code into the dllhost.exe suspended process. This behavior is apparent in the prefetch files at the point of the initial infection. The image below shows the activity. The prefetch files show the sequence of rundll32.exe executing followed by powershell.exe before dllhost.exe. Furthermore, the dllhost.exe prefetch file is missing the process path. The missing process path indicates process hollowing was used as I outlined in the post Prefetch File Meet Process Hollowing. The prefetch files contain references to files accessed during the first 10 seconds of application startup. The dllhost.exe prefetch file contains revealing ones. It contains a reference to wininet.dll for interacting with the network and files associated with Internet Explorer as shown below. This specific prefetch file sequence only occurs upon the initial infection. Future system restarts where Poweliks is loaded into the dllhost.exe process only shows the dllhost.exe prefetch file. The file references in this prefetch still show references to files located in the user profile. The prefetch files contain a distinctive pattern indicating a Poweliks infection. Depending on the sample, autoruns can reveal even more. I mention depending on the sample because Poweliks has changed its persistence mechanism. Initially it used the Run registry key before moving on to a CLSID registry key. I thought one article mentioned Poweliks may not try to remain persistent at all times. If Poweliks does try to remain persistent then its mechanism can be used to find it. Keep in mind, Poweliks has taken self protection measures to prevent this mechanism from being located on a live system. 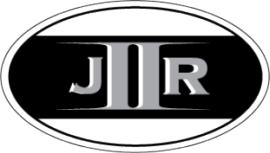 The easiest method to bypass these measures is to access the system remotely with a forensic tool like Encase Enterprise, mount the drive, and then run Regripper across the hives. The image below shows the Run key from the user account on my test system. The sample I used was older since the Run key was used but it still is a tell-tale sign for a Poweliks infection. Fileless malware may leave very little artifacts available on the host's hard drive but it still has to reside in memory. The most effective technique to identify a fileless malware infection is memory forensics. A Poweliks infection is not an exception since it stands out in memory whether if the memory is examined after the initial infection or a system reboot. One area with malware indications is network activity are for unusual processes. @lstaPee alluded to this in their tweet about Poweliks. The Volatility netscan plug-in does show network activity for the dllhost.exe process involving the IP address 178.89.159.35 on port 80 for HTTP traffic. dllhost.exe is not a process typically associated with web traffic so this makes it a good indicator pointing to Poweliks. 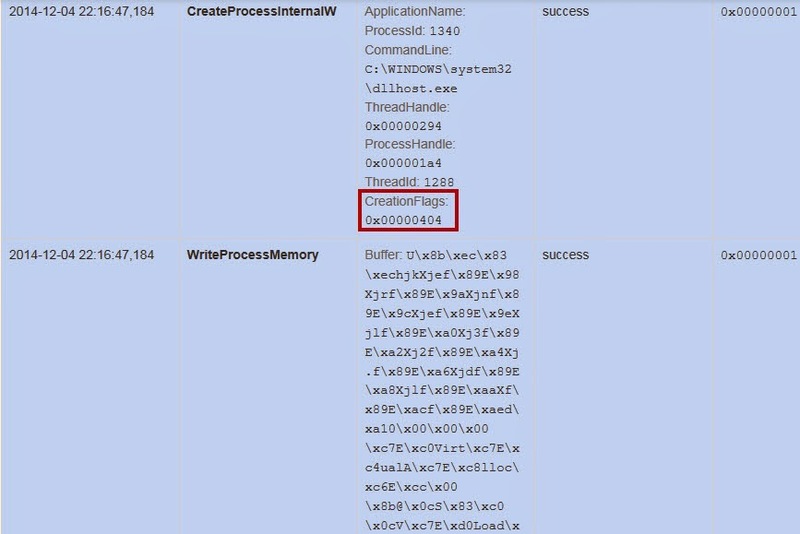 Looking for processes with injected code is an effective technique to locate malware on a system. This is the one technique that absolutely reveals Poweliks on a system. The Volatility malfind plug-in showed the dllhost.exe process with injected code. This matches up to the articles about the malware and behavior analysis showing code does get injected into the dllhost.exe process. The image below shows the partial output from malfind. Extracting the injected code and scanning it with antivirus confirms it is Poweliks. The image below shows the VirusTotal results for the injected code. Microsoft detected the code as Trojan:Win32/Powessere.A which is their classification for Poweliks. The last area containing indicators pointing to Poweliks are the strings in the dllhost.exe process. The method to review the strings is not as straight forward as running a single Volatility plug-in. The strings command reference walks through the process and it's the one I used. The only thing I did different was to grep for my process ID to make the strings easier to review. 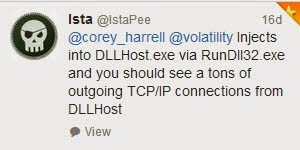 The dllhost.exe strings revealed URLs such as one containing the IP address found with the netscan plug-in. The most significant string found was the command used to make rundll32.exe inject code into the dllhost.exe process as shown below. The presence of this string alone in the dllhost.exe process indicates the system is infected with Poweliks. The change introduce by the Angler exploit kit creator(s) is causing us to make adjustments in our processes. The effective techniques we used in the past may not be as effective against fileless malware. However, it doesn't mean nothing is effective preventing us from triaging these systems. It only means we need to use other processes, techniques, and tools we have at our disposal. We need to take what artifacts do remain and use it to our advantage. This post was specific to the Poweliks malware but the techniques discussed will apply to other fileless malware. The only difference will be what data is actually found in the artifacts. Excellent blog post many thanks for sharing this Corey! Enjoyed this write up and i've passed it along to my co-workers. Great work!